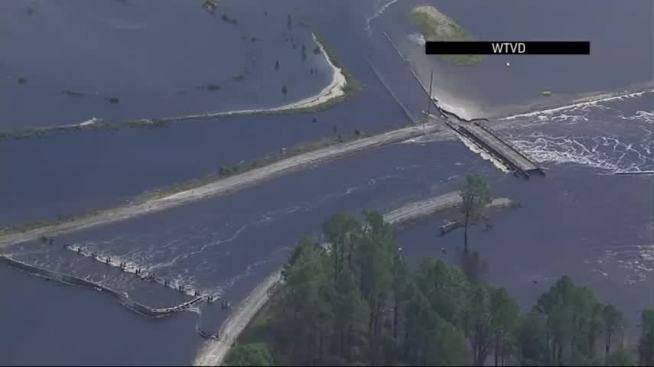 Florence's floodwaters breached a dam holding back a large reservoir at a Wilmington, North Carolina power plant Friday, and coal ash from an adjacent dump could be flowing into the nearby Cape Fear River. Duke Energy spokeswoman Paige Sheehan said the utility doesn't believe the breach at the L.V. Sutton Power Station poses a significant threat of increased flooding to nearby communities. Floodwaters breached several points overnight in the earthen dam at Sutton Lake, the plant's 1,100-acre (445-hectare) reservoir. Lake water then flooded one of three large coal ash dumps lining the lakeshore. Sheehan said the company can't rule out that ash might be escaping the flooded dump into the river. Neither state nor federal environmental regulators were at the scene as of sundown Friday, citing unsafe conditions. The ash left over when coal is burned to generate electricity contains mercury, lead, arsenic and other toxic heavy metals. Duke said Friday the inundated basin at the plant contains about 400,000 cubic yards (305,820 cubic meters) of ash. The area received more than 30 inches (75 centimeters) of rain from former Hurricane Florence, with the Cape Fear River still rising Friday and expected to crest Sunday and remain at flood stage through early next week. North Carolina's top environmental regulator said the possible environmental harm isn't yet known. No state inspectors had arrived by late Friday, though officials said they would be there as soon as conditions are considered safe for personnel to navigate the river and be onsite. "What we don't know at this point is if any coal ash has filtered into the Cape Fear River," said Mike Regan, secretary for the state Department of Environmental Quality, at a news conference in Raleigh. "We plan to conduct flyovers." Federal regulators had also not responded to the scene. "EPA is monitoring this and other sites across the disaster area for potential impacts to the environment and human health," said Trey Glenn, regional administrator for the Environmental Protection Agency. With no regulators there, it was left to Duke employees to collect water samples that would be tested in the company's in-house lab. Duke's ash waste management has faced intense scrutiny since a drainage pipe collapsed under a waste pit at an old plant in Eden in 2014, triggering a massive spill that coated miles (kilometers) of the Dan River in gray sludge. The utility later agreed to plead guilty to nine Clean Water Act violations and pay $102 million in fines and restitution for illegally discharging pollution from ash dumps at five North Carolina power plants. It plans to close all its ash dumps by 2029. State environmental regulators visited the site Thursday, but said they were unable to make a full assessment because of high water levels. The Duke spokeswoman Sheehan said any coal ash release at the Goldsboro site appeared "minimal." Meanwhile, South Carolina's state-owned utility said it expected floodwaters to enter a coal ash pond at one of its closed power plants. Santee Cooper spokeswoman Mollie Gore said the overtopping of an ash basin at the Granger plant near Conway should not be environmentally significant. Gore said nearly all the ash has been removed from the basin and water pumped in to prevent the dike from breaking. The company had placed a 2 ½-foot (72-centimeter) high inflatable berm around the top of a second pond that has more coal ash in it. She estimates 200,000 tons (181 million kilograms) of ash are in a corner of the pond furthest from the rising Waccamaw River. 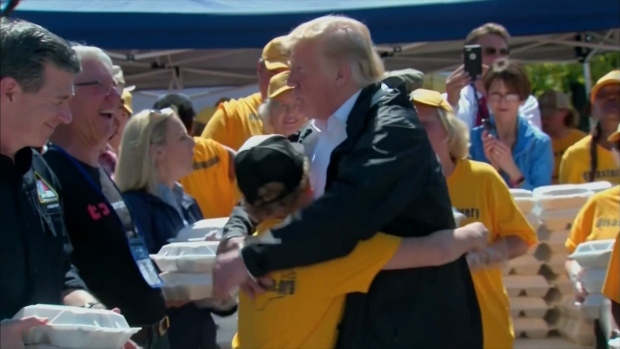 Also in South Carolina, a new round of evacuations was ordered as the trillions of gallons of water dumped by Florence meander to the sea, raising river levels and threatening more destruction. Emergency managers on Friday ordered about 500 people to flee homes along the Lynches River. The National Weather Service said the river could reach record flood levels late Saturday or early Sunday, and shelters are open. Officials downstream sounded dire alarms, pointing out the property destruction and environmental disasters left in Florence's wake. 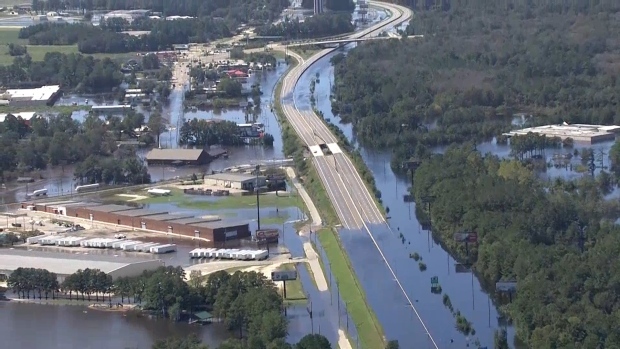 Aerial footage shows the extent of flooding from Hurricane Florence in Lumberton, N.C. The flooding has caused the shutdown of part of Interstate 95. 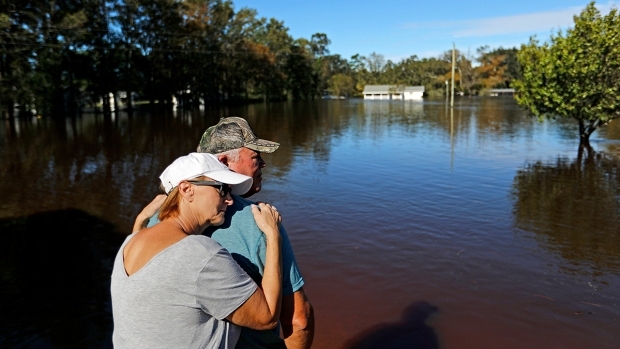 "We're at the end of the line of all waters to come down," said Georgetown County Administrator Sel Hemingway, as he warned the area may see a flood like it has never seen before. Associated Press reporter Jeffrey Collins contributed.